You may be grateful that bugs and beer are not on your Thanksgiving table; but in Mexico, the creepy crawlies are an appreciated delicacy. 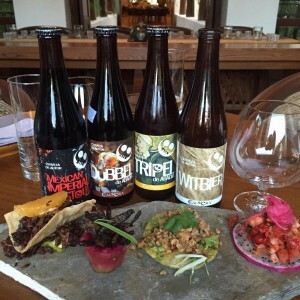 Fairmont Mayakoba Riviera Maya, near Playa del Carmen just south of Cancun, offers luxury resort guests an “Insect Degustation” experience pairing edible insects with craft beers or flights of mescal, for $75 per-person. With a dose of dread I sat in the Fairmont’s fancy Laguna Restaurant’s private dining room overlooking one of the miles of navigable canals that stream through the beachfront resort, golf course, spa and nature preserve. Chef Erika Montesinos elegantly presented the first course of the unique cultural experience. While the chef was telling me this Luisa Salgado, the beer sommelier, was pouring a Calavera Witbier, micro-brewed in Mexico City, to wash it down. The next course: small grasshoppers. “They’re organic. We can only get them during the rainy season when they surface so they are expensive. We dry them, sauté them in onion and garlic and stuff them into a soft tortilla,” said Montesinos. The grasshopper’s fried taste and texture went best with Calavera’s Dubel beer, which is a bit smokier. Acocil, tiny crayfish, were served next with pico do gallo, tomato, cilantro and guacamole sitting on a slice of dragon fruit with a pickled red onion on top. It was like a shrimp salad except it’s crunchier since one eats the heads, legs, and shells, and washes them down with Calavera Tripel brew. Lastly the Chimicuil worms, which come in white or red – the red ones are skinnier and crunchier – and are sometimes eaten alive in a tortilla. These were long dead – flash-fried so they could be served standing up in a piece of hollowed-out tuna like chewy, gritty breadsticks. “You might harvest only three or four of these worms all day in one field, so they are a delicacy,” Chef Montesinos insisted. What serves as desert after such an earthy culinary experience? Rich chocolate cake and ice cream were the reward! I confess, though, I did not qualify for even a spoonful of the sweets since I demurred from actually chomping on the critter cuisine!